Got vs. Gotten – What’s the Difference? Home » Got vs. Gotten – What’s the Difference? Languages are prone to evolve. Evolution of language occurs for any number of reasons, including geographical isolation of a group of speakers, natural change over time, and the need for new words to describe concepts that didn’t exist in the past. In some cases, two different communities decide they want to speak different versions of a shared language simply to differentiate themselves from each other. By some accounts, part of the drive behind forming American and British forms of English was this exact reason. Americans wanted a distinctly American form of English, while the British have been more than happy to reinforce these differences to highlight their own linguistic superiority. Thus, American and British writers often conjugate the verb get differently. What is the Difference Between Got and Gotten? In this post, I will compare got vs. gotten. I will use each of these words in at least one example sentence, so you can see how they appear in context. Plus, I will show you a memory tool that can help you choose either got or gotten correctly in your own writing. Is it got or gotten? Got is a conjugation of the verb get, which means to obtain something. One might get coffee from a café, for instance. To get something could also mean to obtain understanding, as in the phrase I just don’t get math. Got can also be the past participle of get. There has got to be a better way to solve this riddle. He’s finally gotten rid of his chicken pox! What does gotten mean? Gotten is another way to conjugate get as a past participle. I wouldn’t bring up Mark’s drugs use with Sheila, she’s gotten very angry when we tried to talk to her about it in the past. Americans are more likely to use gotten than are the British, who are more likely to use got in this tense. The charts below show the relative usage of gotten vs. got within each language community. While these charts aren’t exhaustive in their literary scope, they only look at books published in English since 1800, they still paint a clear picture of a long-term usage trend. As the above charts show, American writers are more likely to use the word gotten than their British counterparts. But this graph doesn’t show the full story of this word’s use, as there is a usage difference in American English between got and gotten. Gotten usually implies the process of obtaining something. Got implies the state of possession or ownership. Let’s look at a few examples to illustrate this. He has gotten two tickets to the Super Bowl. He hasn’t got any money to go to the concert. The first example is about acquiring tickets to the Super Bowl. The second example is a description of someone’s ability to pay for something. Got is your only option for a simple past tense form of get. As a past participle, however, there is a slight difference in American English usage. Gotten is used when talking about the acquisition of something. Got is used when talking the state of ownership of something. Since gotten is spelled with an N, like the word acquisition, you can remember that that word is used when talking about how something has been acquired..
Is it gotten or got? The verb get is conjugated as a past participle as either got or gotten. American writers differentiate a use for gotten got. 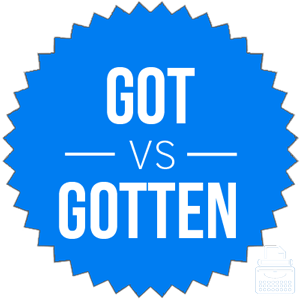 1 What is the Difference Between Got and Gotten? Foul or Fowl – What’s the Difference? Hangar vs. Hanger – What’s the Difference?